U2 iNNOCENCE + eXPERIENCE Live in Paris will be released worldwide on Blu-ray, Deluxe 2 DVD, single DVD and 2 DVD/1 Blu-ray Deluxe Box Set and digital download on Friday, June 10th. The two and a half hour film, directed by Hamish Hamilton, includes guest performances by Eagles of Death Metal and, on the deluxe version, by Patti Smith, which also features behind-the-scenes footage, additional music videos and live tracks and a tour of the visuals narrated by the band’s lifelong friend Gavin Friday. From Songs of Innocence musical highlights include “Cedarwood Road”, “Song for Someone” and the stripped down live version of “Every Breaking Wave”. Career-spanning staples include ‘”I Will Follow”, “Pride (In the Name of Love)”, “Vertigo”, “Sunday Bloody Sunday”, “Until The End of the World”, “Beautiful Day” and “Where The Streets Have No Name”. U2 iNNOCENCE + eXPERIENCE Live in Paris is released on Blu-ray, DVD and digital download. The Standard DVD features 30 tracks (see listing below), the Deluxe DVD and Blu-ray formats come with bonus material including Gavin Friday’s guide to “Cedarwood Road”, a behind-the-scenes piece with director director Hamish Hamilton’s behind-the-scenes documentary, on-stage tour videos for “The Wanderer” and “The Troubles” as well as six music videos commissioned for single releases from Songs of Innocence. 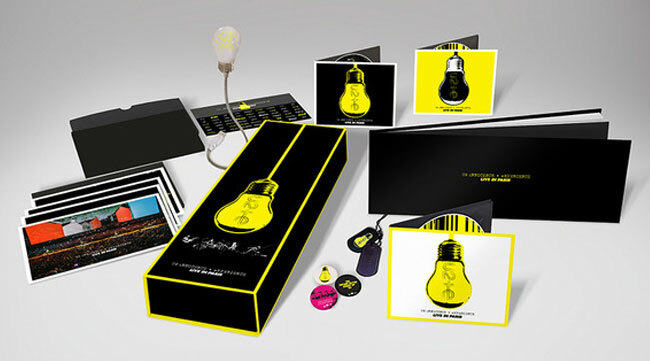 Highlights of the Super Deluxe Box collection include all of the above as well as an exclusive USB light bulb, a 64-Page Hardback Book, Dog Tags, Stencil Set, Pin Badges and a special code to download the video of the entire show.